What’s up with the new light-colored roads across Los Angeles and how will these surfaces affect drivers? The city of Los Angeles is partnering with GuardTop® LLC to help mitigate the heat island effect impacting the city’s neighborhoods and urban areas. The light-colored substance you’ve been seeing around LA is a cool pavement treatment called CoolSeal by GuardTop®. CoolSeal is a light grey asphalt-based sealcoat that is similar to other asphalt sealcoat products often used in parking lots and neighborhoods. However, unlike traditional black pavement, CoolSeal is designed to achieve lower surface temperatures through its lighter color and solar reflectivity. Ten common questions and misconceptions that people often have about CoolSeal. 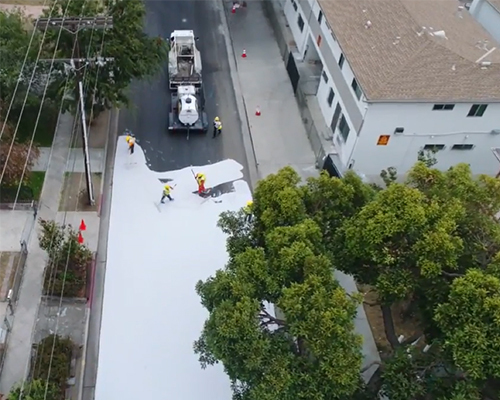 1) Why is the city using massive quantities of paint to coat streets? Contrary to many incorrect statements made by the media, CoolSeal is not a paint. CoolSeal is a high-performance, asphalt-based sealcoat. CoolSeal is environmentally friendly and helps to maintain the performance and durability of underlying asphalt. Articles that claim CoolSeal is a paint are simply mistaken. 2) How does CoolSeal work? Unlike conventional black sealcoat, CoolSeal is designed to reflect the sun’s energy to produce cooler surface temperatures through its lighter color and increased reflectivity. CoolSeal can reduce surface temperatures by 10-25 degrees Fahrenheit (under certain conditions). While conventional black asphalt absorbs the sun’s rays and can reach temperatures in excess of 160 degrees Fahrenheit, CoolSeal is designed to reflect sunlight and reduce pavement temperatures. It’s similar to the difference between a tan and black car on a hot day. Black pavement can get so hot that it burns off pet’s paw pads and creates an unsafe environment for children to play on. Black asphalt is also a contributing factor to the heat island effect. 4) What is a heat island? Heat islands are areas with significantly higher temperatures than surrounding rural areas. According to the EPA, heat islands can affect communities by increasing summertime peak energy demand, air conditioning costs, air pollution and greenhouse gas emissions, heat-related illness, mortality and by decreasing water quality. The EPA states that cool pavements such as CoolSeal can help mitigate heat islands. 5) Why is the city spending so much money? Is CoolSeal expensive? The price of CoolSeal is actually very similar in price to current street programs used in various cities to maintain roadways and is relatively low in cost. 6) How long does CoolSeal last? CoolSeal provides surfaces with longer lasting protection and less frequent applications are required to maintain performance. This translates to reduced cost and less inconvenience to drivers. A two-coat application of CoolSeal can last twice as long as conventional sealcoats. 7) Will the reflective nature of CoolSeal blind drivers like snow? Unlike snow, CoolSeal is light-grey and dries with a matte finish which does not cause glare for drivers or pedestrians. 8) Is CoolSeal safe to drive, bike or skateboard on? CoolSeal has been shown to meet skid safety requirements and performs similarly to conventional sealcoats which many people drive on daily, such as residential areas and parking lots. 9) Will CoolSeal be covered in tire marks and dirt? CoolSeal wears similarly to other light-colored surfaces like concrete. Normal street cleaning is recommended to maintain reflectance. 10) Why doesn’t the city just plant trees? CoolSeal works in conjunction with trees and vegetation to help mitigate heat islands. Planting trees is just one part of the solution. According to the EPA, cool pavements such as CoolSeal can reduce the temperature of storm water runoff and improve water quality, increase nighttime visibility, improve local comfort, and reduce lighting requirements which saves energy and money.